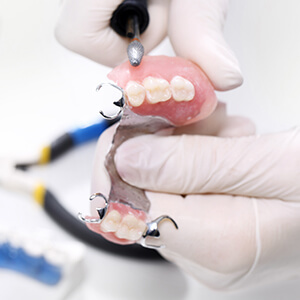 A removable partial denture or bridge usually consists of replacement teeth attached to a pink or gum-colored plastic base, which is sometimes connected by metal framework that holds the denture in place in the mouth. Partial dentures are used when one or more natural teeth remain in the upper or lower jaw. Not only does a partial denture fill in the spaces created by missing teeth, it prevents other teeth from changing position. A precision partial denture is removable and has internal attachments rather than clasps that attach to the adjacent crowns. This is a more natural-looking appliance. Valplast flexible partials is a solution to replace one or more teeth. Valplast flexible partial denture is made from a flexible plastic material which fits into your mouth after a series of appointments and they blend naturally with the color of your gums, nearly invisible. They do NOT require any metal clasps to keep them in place.